Can you smell the oats? This post should have a certain smell wafting from your computer screen to give you the full effect of this place. 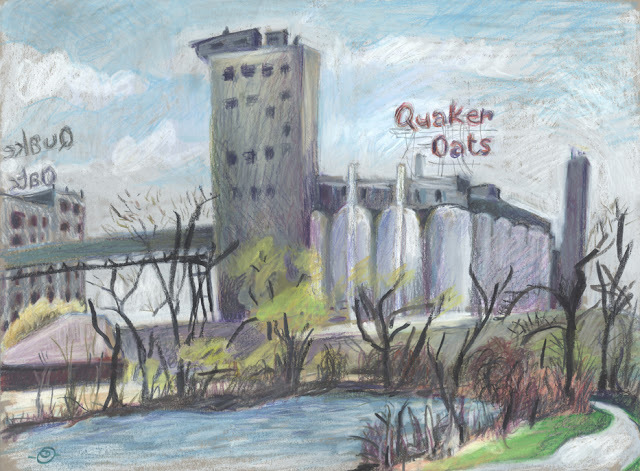 Anyone who has ever driven through Cedar Rapids knows that this city in Northeast Iowa has an unmistakable aroma, day and night, that emanates from the Quaker Oats cereal mill. It’s the homey, calming smell of oats being made into oatmeal, oat bars, oat bran, oat porridge, oat cookies, oat granola, and (perhaps your child’s favorite) Cap’n Crunch oat cereal. 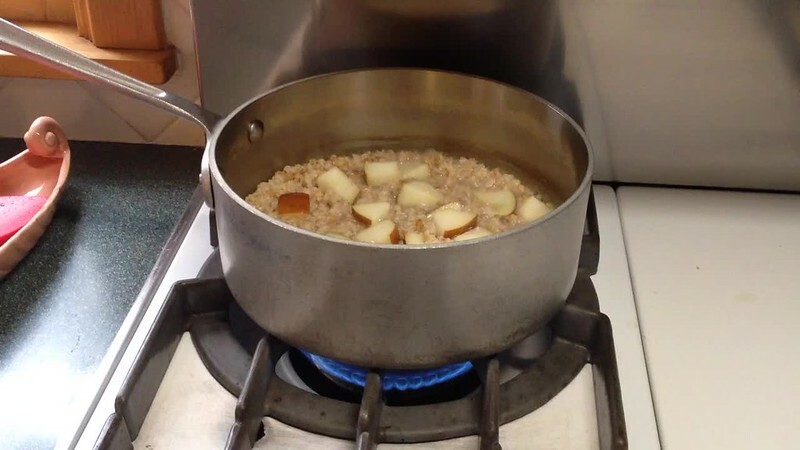 Since there’s no application that I know of that records and transmits odor via the Internet, I thought I’d whet your olfactory imagination with this short movie of my husband making our morning oatmeal. The aroma from this saucepan is also the aroma of Cedar Rapids. Cedar Rapids is a city 60 miles southeast from where I live in Cedar Falls. 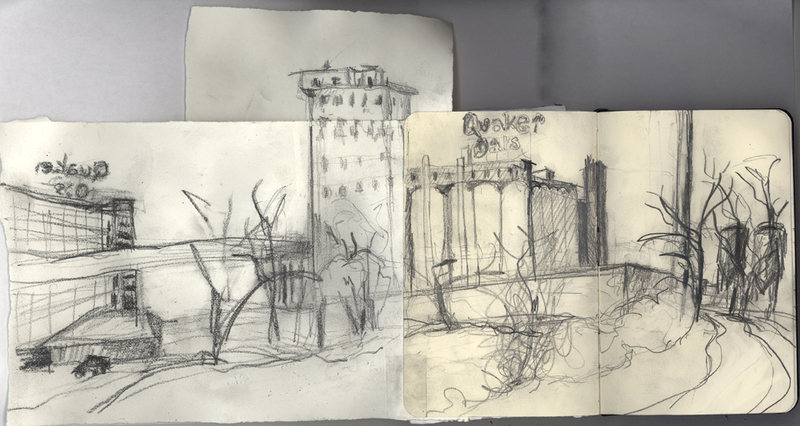 On one of the first beautiful Spring days, I drove down the four-lane specifically to find a site-line where I could capture the Quaker Oats factory. Prior to this, I’d only observed this landmark structure from the elevated highway, going by at 55 mph. A massive lineup of white concrete grain silos, topped with iconic red neon signs, the plant figures prominently in the city’s downtown. It’s on a floodplain of the Cedar River and a small lake. A vast network of train tracks, active with grain cars from many other Midwestern states and from Canada, feed towards the plant. I found my spot to draw along a recreational trail, which parallels the tracks and the lake edge. The facility is huge. I was only able to show part of it. I struggled with the preliminary sketch. My pocket-size Moleskin just wasn’t big enough! I added extensions, but still couldn’t fully capture the expansive scene before me. I’ll have to plan another sketching excursion to Cedar Rapids for another try at Quaker Oats. I’ll bring bigger paper. Somehow I’ve got to figure out how to include the railway yards, too.